Are you worried that you may be overweight? First up, we advise you to talk to your doctor about your weight. He or she will be able to tell you whether or not you are actually overweight. Being overweight means your weight is higher than what is considered normal weight for your height. In the past, height-weight charts were used to measure weight, but more reliable methods are favored now. Your doctor will want to assess how your weight is impacting your risk of developing weight-related health conditions. If you are found to be at increased health risk with any of these assessment tools, you'll be advised to lose weight to lower your health risks and improve your overall health. Percent body fat (PBF) can be assessed by measuring body composition (how much of your body is fat or non-fat) with a painless test called a caliper measurement. This test measures subcutaneous (under-the-skin) fat using a skinfold caliper. The caliper is used to grasp a fold of skin and pull it away from your muscle. The folds are usually measured at the waist, hips, and thighs, and several other locations on the body. The findings are then calculated into a formula that allows your body fat to be estimated. There are a few reasons why percent body fat measurement may not be ideal: The older you are, the less likely the results are to be accurate since fat distribution changes as we age. Caliper measurement is best for those under the age of 55, though it can become less accurate by your 40s. Additionally, the accuracy of the results can vary according to the skill of the person taking the measurements and the quality of the caliper used to take the measurement. Lastly, the more overweight an individual is, the less accurate the results are likely to be. Other methods of assessing body composition include bioelectrical impedance, DEXA scan, and BodPod tests. What Does Your Percent Body Fat Mean? The American College of Sport Medicine advises that women should have between 20% and 32% body fat and it recommends between 10% and 22% for men. Higher percentages would indicate that a person is overweight. Health risk-related standards for body fat ranges were identified in a study that was published in The Journal of Clinical Nutrition in 2000. According to those findings, a woman between the ages of 20 and 39 has increased health risks at 33% body fat; the risks greatly increase at 39%. For men, health risks were found to increase at 20% body fat and greatly increase at 25%. PBF assessment is not as widely used as other methods of assessing weight. The Clinical Guidelines on the Identification, Evaluation, and Treatment of Overweight and Obesity in Adults suggest that since PBF is expensive to assess and equipment is not always readily available, BMI is a more practical approach than PBF. Waist-to-hip ratio (WHR) is calculated by taking your waist circumference and dividing it by your hip circumference. You may sometimes hear body shapes referred to as "apples" and "pears." These two descriptors are related to WHR. Someone who is apple-shaped carries bulk around their midsection, while those who are pear-shaped carry their weight in the hip area. To calculate your WHR, you will need a tape measure. You should measure your waist at its narrowest point and your hips at their widest point (see illustration). Then, divide your results from your waist by the results of your hips. The resulting number is your waist-to-hip ratio. WHR is used to assess risk for heart disease and hypertension in particular. Research has shown that waist-to-hip ratio is even better for determining risk of heart problems than body mass index. Those who are considered "apples" are at a much higher risk for heart disease and hypertension than "pears" who carry their weight in the hips or thighs. Research has shown that abdominal fat particularly raises health risks for women. What Does Your Waist-to-Hip Ratio Mean? High cardiovascular risk for women is found with ratios higher than 0.85, and 0.90 for men. As the ratio increases so does the risk. 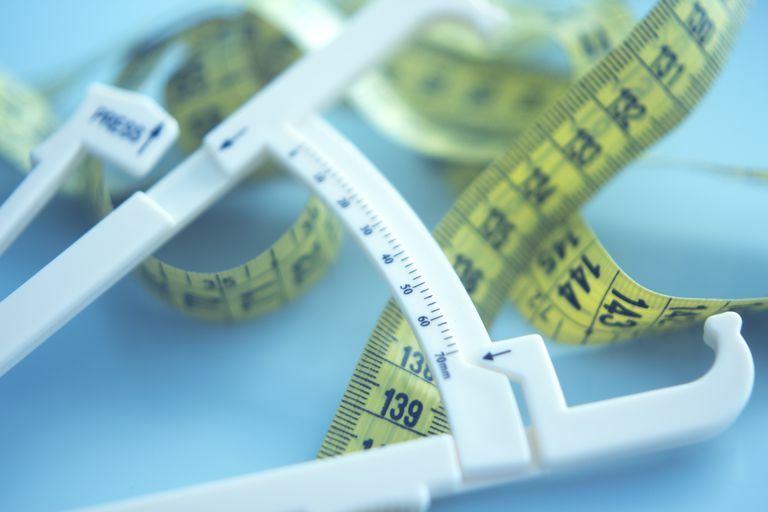 BMI can be determined by dividing your weight in pounds by your height in inches squared and then multiplying by 705. For example, a woman who is 5'6" and weighs 190 would have a BMI of 31. An individual is considered underweight if their BMI is less than 18.5. A BMI of 18.5 to 24.9 is considered a "normal" weight. Individuals who fall into the BMI range of 25 to 34.9 begin having some health risk concerns. A BMI of 30 or more qualifies an individual as obese. Specifically, those who have a high BMI and a waist size of more than 40 inches for men, or 35 inches for women, have a higher risk for obesity-related health problems such as diabetes, high blood pressure, and heart disease. American College of Sports Medicine. ACSM Fit Society Page. Body Fat Composition: How to Measure It and What Does it Mean, Winter 2006-2007. Centers for Disease Control, CDC.gov. Body Mass Index: About BMI for Adults. Gallagher, Dymna and Steve Heymsfield, et al. "Healthy Percentage Body Fat Ranges: an Approach for Developing Guidelines Based on Body Mass Index 72 (3): 694." 24 Jan 2000. American Journal of Clinical Nutrition. Kanai, H. and Y Matsuzawa, et al. "Hypertension: Journal of the American Heart Association". Close Correlation of Intra-abdominal. 15 June 1990. American Heart Association. "Percent Body Fat – 2." Percent Body Fat – Skinfold Measures. Shape Up America. Yusuf, MD Salim, et al. "Obesity Measure Should Be Redefined to Accurately Assess Heart Attack Risk." Nov 2005. McMaster University.